The 2013 version of the FootJoy Contour Casual golf shoe is a bit more stylish version of the original and I think this is a good improvement. The Casual is based on the FootJoy Contour shoe and like that shoe, it is based on quite a roomy last. The last is the form of the foot around which the shoe is shaped. If you find other styles too narrow then you will like the Contour family as they seem wider and deeper than most other FootJoy styles, so you may have to go down half a size. The leather uppers are very high quality and unlike some other makes of spikeless shoes you get the feeling that these will stand the test of time. They shoes come with a 1 year waterproof warranty and the have so far lived up to that, although they have not been subjected to a proper 'British summer'. As the name Casual suggests, these FootJoys are meant to be worn on and off the course and therefore they come with a spikeless Duramax sole. This contains lots of rubber nodules that provide the grip and in general they are very comfortable on the course. The nodules are a little more rigid than some of the competition, so walking on hard surfaces such as concrete is not as easy on the feet as walking with a normal soft soled shoe. The pattern of the grips on the sole seems a little random and more thought could have gone into the shape and flexibility of the design. Other manufacturer's claim to have multi-angled rubber spikes and some spikes that flex a little more. The Contour Casual spikes do perform adequately, but FootJoy could do better here as I feel they are a little firm for off-course and not technical enough for on-course. Maybe a choice of sole would be better? However, the sole apart these are a very high quality golf shoes and the real icing on the cake is the MyJoy versions of the Contour Casual that you can order online. There are literally thousands of combinations available through the excellent online design service and you can therefore match your shoes to your clothes or your mood. This brings the Casual side of the shoe to the fore and why a better off course sole would help, as you can design some excellent smart casual shoes here and pretend to not be golfing when you actually are. I ordered a pair of MyJoy Contour Casuals and after many happy hours designing shoes with my children, I exercised my veto on the purple and lime version to go for the ones below. And this is what turned up! Again I was very impressed with the production quality and the leathers used are well worth the extra investment, even though it is a lot for a pair of casual shoes. So overall I love the MyJoy options and the build quality, but the sole could be better so that and the price cost it a star, with a little bit of regret. 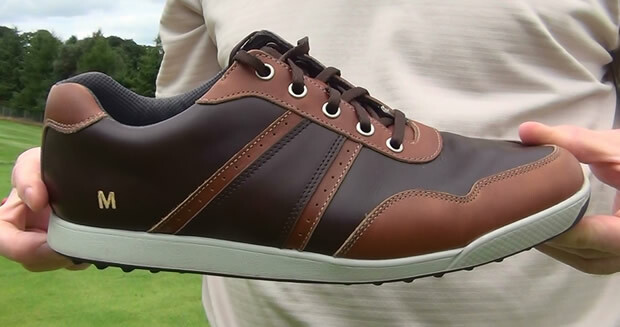 FootJoy have added the Contour Casual shoe to their popular MyJoys programme.